Alexandra sets the vision and strategy for Eliza, and is responsible for maintaining Eliza’s leadership position in the healthcare industry. She has devoted her career to inspiring people to lead healthier, happier and more engaged lives through the use of innovative technology, and her entrepreneurial spirit and passion for technology and design have led to the launch of four successful healthcare ventures over the past 15 years. 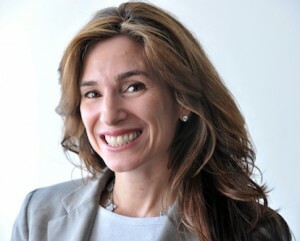 Alexandra is currently Founder, Chief Visionary Officer, and Chairman of the Board of Eliza Corporation, the pioneer and leader in Health Engagement Management and one of Entrepreneur magazine’s “100 Brilliant Companies.” The company’s intelligent, tailored interactions—including automated calls powered by a patented speech recognition engine, rich web and multi-modal delivery platform and proprietary sophisticated data analytics—make health and healthcare information more accessible, more actionable and more engaging. Examples of Eliza’s impact include increasing the number of patients who get their recommended diabetes screenings by 76%; more than doubling prescription refills over a six-month period; quadrupling participation in an online smoking cessation program; and boosting younger members’ perceptions of their health plans’ brands beyond what far more expensive traditional advertising campaigns deliver. Alexandra is also a co-founder of Engage with Grace, a not-for-profit movement launched in October 2008 aimed at helping people understand, communicate and have honored their end-of-life wishes. Based on her experience engaging people in conversation about health topics, in 2010 she co-founded a non-profit, web-based movement called SeduceHealth that aims to reframe how the healthcare industry communicates with the people it serves by adding greater passion, joy, and inspiration. Alexandra sits on the board of Eliza, the Board of Trustees for Beth Israel Deaconess Medical Center (a Harvard Teaching Hospital) in Boston, MA, the Board of Advisors of TEDMED, the Board of Directors for the Society for Women’s Health Research (a national non-profit organization dedicated to improving women’s health through advocacy, education, and research), and the Harvard Executive Sleep Council. She also sits on the Board of Directors and the Operations Committee of the Coalition to Transform Advanced Care (C-TAC) and co-chairs C-TAC’s Public Engagement Workgroup. Alexandra has been named to the Boston Business Journal’s “40 Under 40” list and also appears on the Healthspottr Future Health 100 list, which includes some of the most creative and influential people working in healthcare today.